Payment process profile end with "Waiting for payment file processing"
1. Submit Payment Process Request. 4. See that the request ends in status of "waiting for payment file processing". When running PPR, user can choose whether to automatically create the payment file or submit create electronic/printed payment file ESS request later on manually. This is controlled by 'Create Payment Files Immediately" check box under Payments & Processing options tab of the PPR. In this case, user ran the PPR with out checking 'Create Payment Files Immediately" check box. Hence the process stopped after creating the payments. Next step is to create a formatted payment file for these payments. 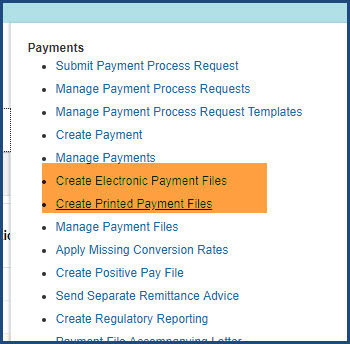 To continue with processing of this PPR, customer can manually run 'Create Printed Payment Files' request by clicking on Create Printed Payment Files link in Payments dashboard. To automatically create the payment file with out this manual intervention, submit PPR with 'Create Payment Files Immediately" check box selected.